Kuwait, QEII, 1953 Coronation set of 4 stamps in BLOCKS OF 4, UM / MM, Cat £58. Scott 64 SG 57 = MLH. MNH: Original gum, no disturbances what so ever. Space filler: Faulty. VFU: Light cancel, good centered. Information about how quality is graded SON: “Socked on the nose” superb cancel, no smuthering, perfectly centered, lightly cancelled. 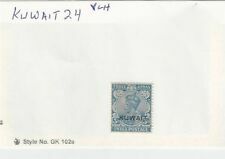 KUWAIT YR.1952.OVERPRINT STAMPS R-COVER TO INDIA BOMBAY. 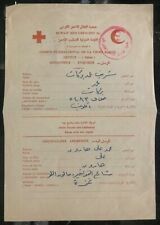 Up for auction is a beautiful letter sheet cover from an Arab soldier captured by Kuwait . In excellent condition. Priced to sell. Red Cross. Prisoner of war, POW Shipping will be a flat $3.00 within the continental U.S. for USPS mail. Overseas airmail shipping is $17.00. Questions? Please contact me at: azteccollectables at hotmail.com. Check out my other online auctions of rare and vintage stamps. My e bay store, Aztec Collectables, has a fine and growing selection of unique covers, stamps and postcards. Please make pay arrangements within 72 hours of winning the auction. I will combine shipping on multiple wins, if you want combined shipping wait until I invoice you. MNH: Original gum, no disturbances what so ever. Space filler: Faulty. VFU: Light cancel, good centered. Information about how quality is graded SON: “Socked on the nose” superb cancel, no smuthering, perfectly centered, lightly cancelled. Scott 48 SG 41 = MLH. MNH: Original gum, no disturbances what so ever. Space filler: Faulty. VFU: Light cancel, good centered. Information about how quality is graded SON: “Socked on the nose” superb cancel, no smuthering, perfectly centered, lightly cancelled. 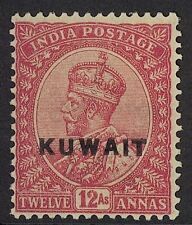 KUWAIT (PP2102B) ON INDIA KGV 3A-4A SG 21-2, 22A MOG. WE WANT YOU TO BE HAPPY. KUWAIT (P2005B) SG 131-143 MOG. WE WANT YOU TO BE HAPPY. KUWAIT.1953 QE11 CORONATION.COMPLETE. UN/ MOUNTED MINT. MH: Original gum, hinged or other disturbances. MNH: Original gum, no disturbances what so ever. Space filler: Faulty. VFU: Light cancel, good centered. Information about how quality is graded. KUWAIT Rare Reg. ناية بيزة Sent by Oval Reg. Cachet SAFAT to Cairo 1960.